Kirkland Family Dentistry wins ‘best of’ for fourth straight year. 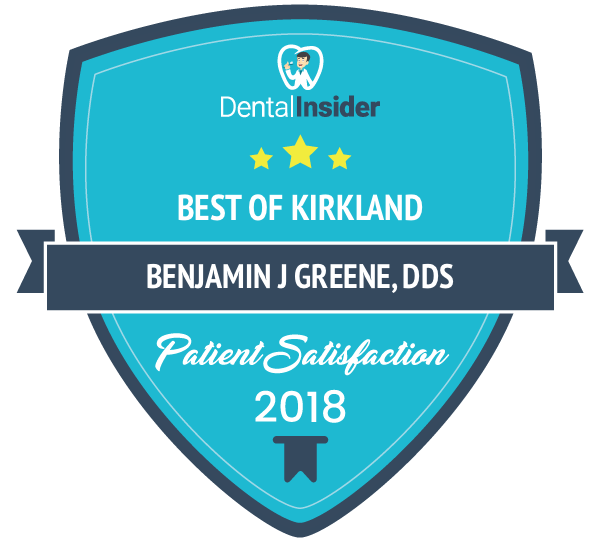 For the fourth year in a row, Kirkland Family Dentistry received the Best Dentist in Kirkland award from the Kirkland Reporter newspaper. The annual award is chosen by newspaper readers. The newspaper runs the contest and covers a wide variety of businesses throughout the Kirkland area. The paper gathers the results and announces the winners. Last year the clinic announced it planned to work even harder to receive the award for 2018. When the announcement was made, the entire office erupted in cheers. Obviously, the work paid off with the fourth win for the dental clinic. With the fourth award in hand, Dr. Everett said he is certain this sets the stage for an even greater challenge for next year. “We are going to work even harder to make our office the place people want to come to. Our patients deserve the very best and this is the only level of service we will accept,” he said. Kirkland Family Dentistry offers routine cleanings, preventative treatment, SonicFill fillings, crowns and bridges, teeth whitening, mouth guards, dentures, Invisalign clear braces and more. Kirkland Family Dentistry is a full-service dental clinic. For more information call or text (425) 822-0435 or visit Kirkland Family Dentistry.